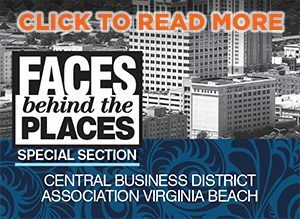 Posted by Ryan Miller on Nov 28, 2017 in Biz Report, What's On Your Desk? 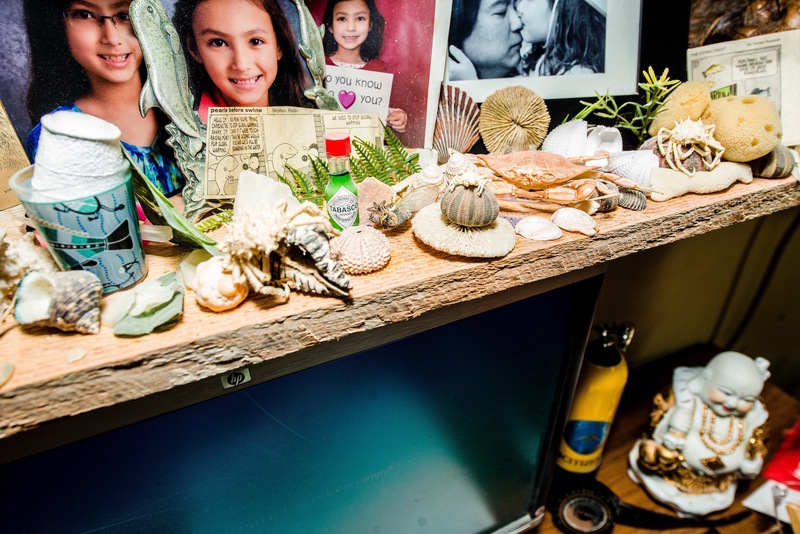 The office space of Sonny Alejo is a diver’s locker full of equipment and mementos, an eclectic mishmash of sunken treasures collected from sea explorations and underwater excavations. 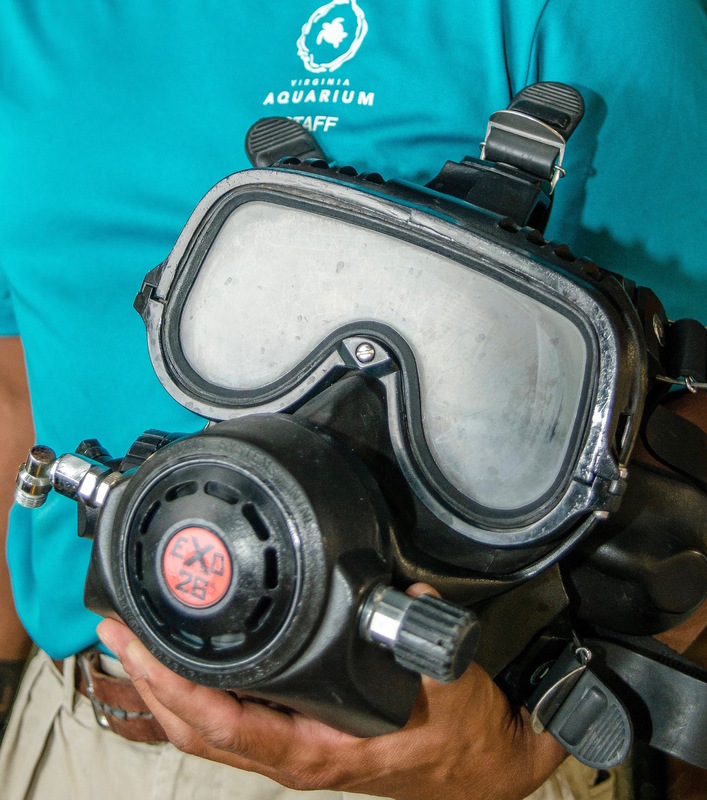 As dive safety officer and dive operations manager for over 10 years at the Virginia Aquarium & Marine Science Center, Alejo oversees all of the diving at the facility, in the exhibits and out at sea, ensuring all diving procedures by aquarists and dive staff are properly followed. “It’s a lot of accountability for people’s safety,” Alejo shares. He grew up around the East Coast and Hawaii in a Navy family. His father was a master chief and instilled Sonny’s appreciation of the ocean while living near the water. “That’s how I got into diving. 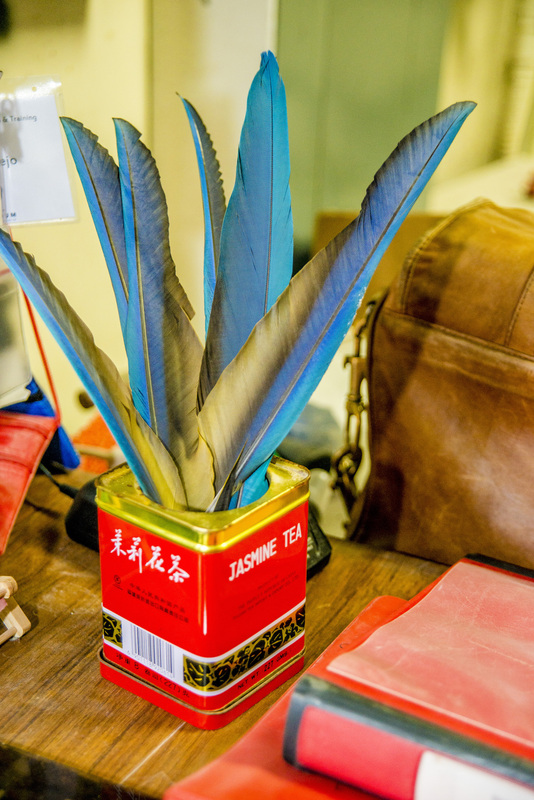 That’s part of the life.” The objects found on Alejo’s desk, surrounded by dive flags and a mechanical compressor for pneumatic tools that loudly shoots air out of its valves, are as compelling as his aquatic adventures. When connected to a diving tank, the fully equipped face mask permits breathing underwater for long periods of time, and the regulator balances air pressure for deep depths. Alejo wears the face mask with his suit and unique Force Fins at facilities on-site and while on diving explorations with universities out at sea on the Virginia Aquarium’s Ocean Explorer Research Vessel. Alejo used this depth gauge during his earliest diving days and has since retired the piece of scuba diving equipment. 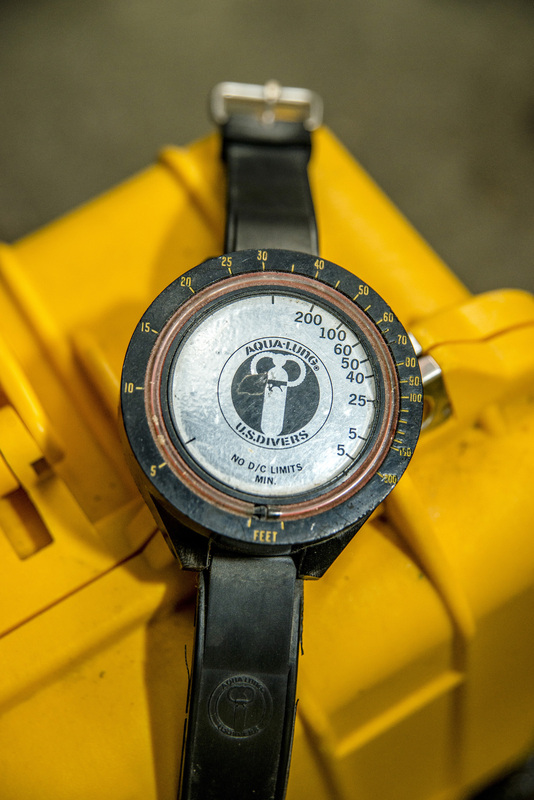 While gauges made these days have digital displays, this relic, which was made in France, has an analogue display that determines the depth of water so that divers can avoid decompression sickness, also known as the bends. Alejo may not be afraid of sharks, but he is terrified of clowns. 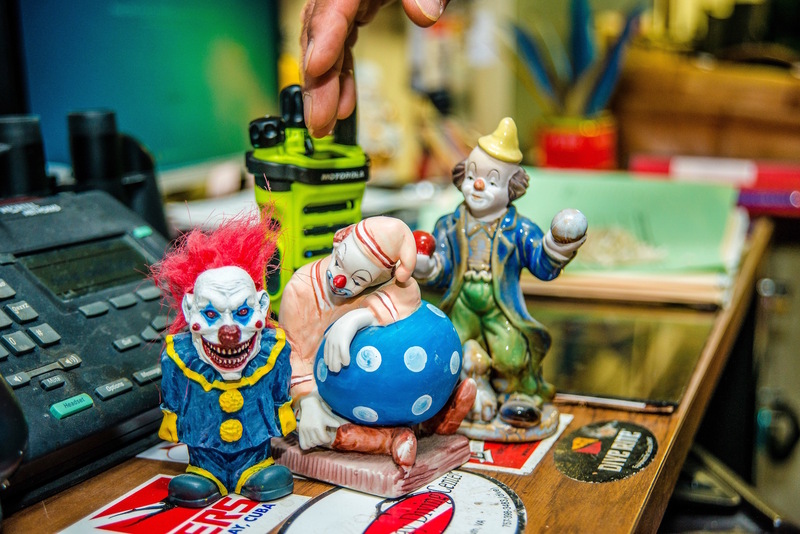 “Friends” have continuously gifted him desktop clowns that he turns to face the wall while he works. “They even set up one that was life-sized with eyes on it in the locker,” he tells. 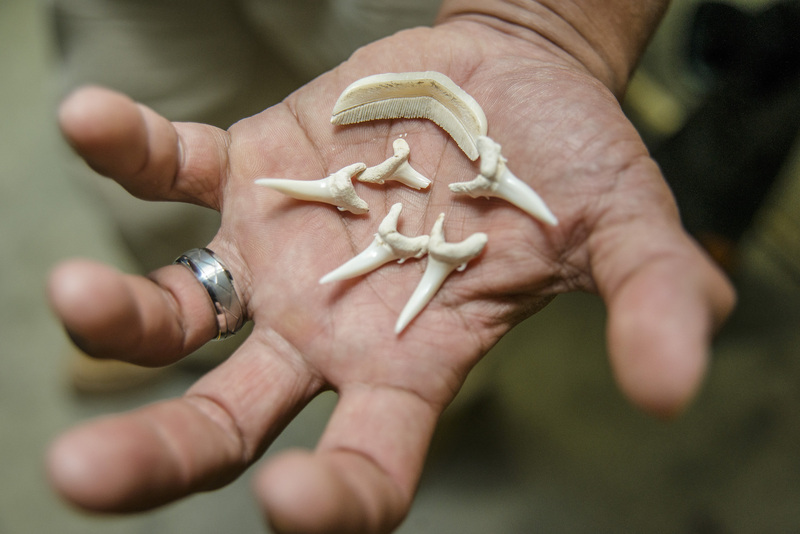 “These here are within the Red Sea exhibit itself, and the larger ones I found out diving,” Alejo says as he holds out a handful of razor-sharp teeth. “Sharks always grow back new teeth; it’s one of their biggest assets. They bite a lot, so they grow back. The same thing with rays. The rays have rows and rows going back.” As a part of the aquarium’s animal husbandry, Alejo and the Dive Operations team regularly swim with pinniped seals, eagle rays, sharks and sea turtles. He gets up close with sandbar, nurse, zebra and sand tiger sharks at the aquarium. “All of the shells are from water collections.” Discovered during dives, Alejo has gathered shells, coral, sea urchins, sponges and crab molts. “When we bring them back they’ll be healthy enough that they can molt out.” The scattered tokens of the sea surround photos of his daughter. Alejo works with animals and lives with them too. He’s had Oliver, a blue and gold macaw, since 1989. The parrot is native to South America and is considered a vulnerable species of bird. 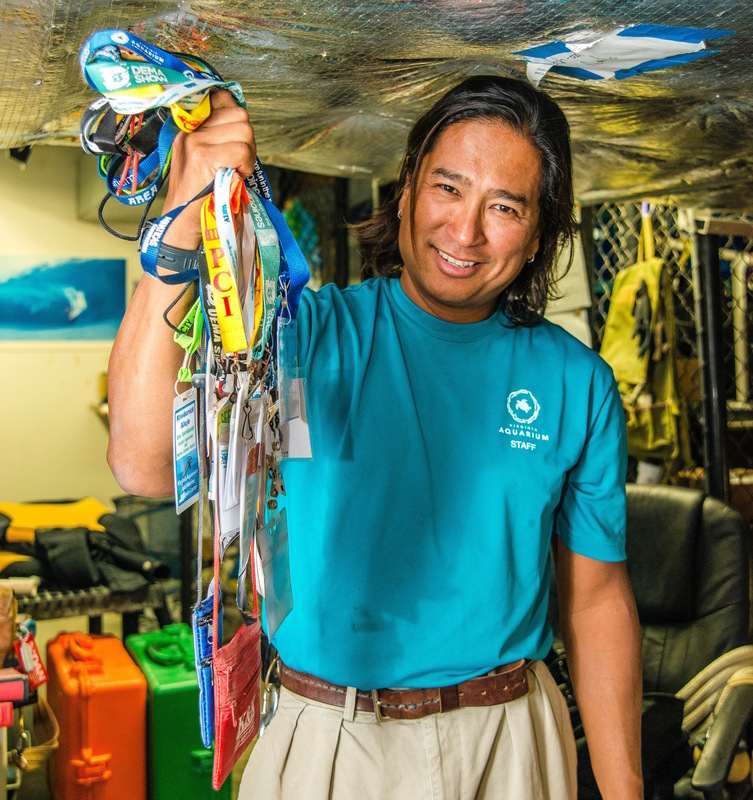 Alejo keeps a collection of lanyards hanging over his desk as a reminder of all of the places he’s been sent for diving, including conventions and learning facilities. His diver education includes training in diver stress and rescue, dive instruction, technical diving, first aid and CPR, first responder rescue, swimming and equipment.